It is with regret and sadness that we must report the death on 7 January of Sir Christopher Wallace, Chairman of the Royal Green Jackets (Rifles) Museum 1999-2015. The Museum owes him a great debt of gratitude for 16 years of dedication to researching, recording and displaying the history and heritage of The Royal Green Jackets. He will be greatly missed. 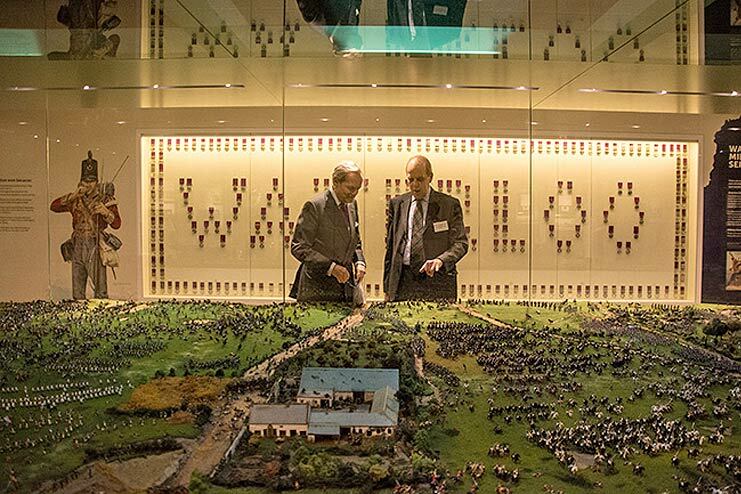 Lieutenant General Sir Christopher Wallace briefs His Grace the Duke of Wellington on the refurbished model at the opening of the Waterloo display. Lt Gen (retd) Sir Christopher Wallace was commissioned into 2nd Green Jackets (Kings Royal Rifle Corps) in 1962. In 1966 this Regiment was amalgamated into The Royal Green Jackets with whom Christopher Wallace served in the second and third battalions rising to command of the 3rd Battalion in Germany and Northern Ireland from 1983 to 1985. His subsequent appointments included command of 7th Armoured Brigade, Director of Public Relations (Army), GOC 3rd Armoured Division and Commandant of the Army Staff College, Camberley. In 1994 he was selected to establish the Permanent Joint Headquarters (UK) at Northwood subsequently being appointed the UK’s first Chief of Joint Operations. He was knighted in 1997 in recognition of his service. His Honorary appointments included Colonel Commandant of the Royal Green Jackets and Colonel Commandant of the Light Division. He retired in 1999 taking up the post of Commandant of the Royal College of Defence Studies from January 2001 until January 2005. An accomplished golfer and cricketer his principal passion was military history. After a short spell on the Board of the Imperial War Museum he took on the role of Chairman of the Trustees of The Royal Green Jackets (Rifles) Museum a position he held for 16 years. His dedication to the role, diligence in researching, recording and displaying the heritage of The Royal Green Jackets culminated in the award winning and widely acclaimed exhibition ‘With The Rifles to Waterloo’ opened to coincide with the 200th anniversary of the Battled of Waterloo. Rifles and Kukris: Delhi, 1857, (2007).